Keto Certified is the world’s first and most popular Keto Diet Certification program. The Keto Certified Program Standards were designed to standardize Keto claims while improving the quality of available Keto Foods on the market. Meal and Meal Replacement Products must not contain more than 10g net/effective carbohydrates per serving. For products which contain largely whole unprocessed ingredients or ingredients with reduced digestibility, a 12g net carbohydrate per serving is permissible for use of the Keto Certified label. 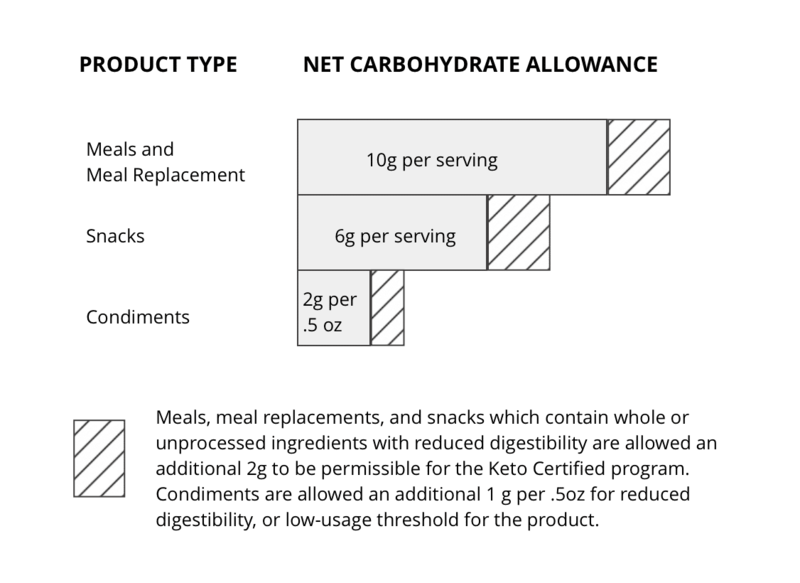 Snack Products must not contain more than 6g net/effective carbohydrates per serving. For products which contain largely whole unprocessed ingredients or ingredients with reduced digestibility, an 8g net carbohydrate per serving is permissible for use of the Keto Certified label. Condiments must not contain more than 6g net/effective carbohydrates per serving. For products which contain largely whole unprocessed ingredients or ingredients with reduced digestibility, an 8g net carbohydrate per serving is permissible for use of the Keto Certified label. Exogenous Ketone Supplementation is allowed in the Keto Certified program, provided that the ketones are naturally-derived beta-hydroxybutyrate compounds, such as beta-hydroxybutyrate mineral salts, and medium-chain triglycerides. Qualification for Ketone esters are not included in the Keto Certified program at this time but may be considered in the future provided adequate safety research. Keto Certified Products should not contain the following ingredients to be eligible for use of the Keto Certified label. Partially-Hydrogenated trans fats such as soybean, margarine, and vegetable oils. Alcohol ketone bodies, Ketone esters. Artificial Sweeteners such as saccharin, cyclamate, acesulfame, aspartame, sucralose. Corn syrups and Maltitol. Artificial flavors are not allowed in the Keto Standards. All meats are allowed in the Keto Certified program. All seafood is allowed in the Keto Certified Program. All vegetables and fruits are allowed. Vegetable Juices Sea vegetables, Seaweed, Algae, Dried Fruits, Fruit Juices, Berries. Pastured and Grass-fed tallow, lard, ghee, butter, cheese, duck fat, Non-Hydrogenated lard. All nut oils, Red Palm Oil*, Avocado Oil, Olive Oil, Coconut Oil, High-Oleic Sunflower Oil, Cocoa Butter, and Peanut Butter. Gelatin, Collagen, Bone Broths, Protein concentrates, isolates, and hydrolysates including whey, casein, egg white, pea, chickpea, soy, peanut, and hemp proteins. All unsweetened or low-sweetened nut milks are allowed. Other allowed milks include, but are not limited to: Hemp Milk, Almond Milk, Coconut Milk, Cashew Milk, and Tigernut Milk. All nuts and seeds are allowed. Nut Butters must be unsweetened or low-sugar. Apple Cider vinegar, Distilled vinegar, Sauerkraut, Kimchi, Kombucha, Coconut Kefirs, Coconut Yogurt and Nut-based yogurts are allowed if unsweetened or low sugar. All spices are allowed, provided they do not contain ethoxyquin which is not permitted in the Certified Paleo Program. Salt, Sea salts, smoked salts, and salt blends are also allowed. Mucilages such as psyllium husk, and chia seeds are permitted within the Keto Certified Program. All roots and tubers are allowed, including potatoes provided that they meet the macronutrient requirements as outlined herein. Allowed flavors include essential oils, oleoresins, extracts*, distillates*, and ingredients that contain flavoring derived from spices, fruits, vegetables and other plant material, meat or insect derivatives, insect oils, and stearic acid*. Honey, stevia, coconut sugar, date sugar, fruit juice, monk fruit, lo han guo, inulin, tapioca maltodextrin and sugar alcohols except for maltitol. All coffees and teas are allowed in the Keto Certified Program. Sunflower Lecithin, Egg-Derived Lecithin, All food-grade Hydrocolloids, Lactic Acid, Citric Acid, Ascorbic Acid, anti-caking Silicon Dioxide.